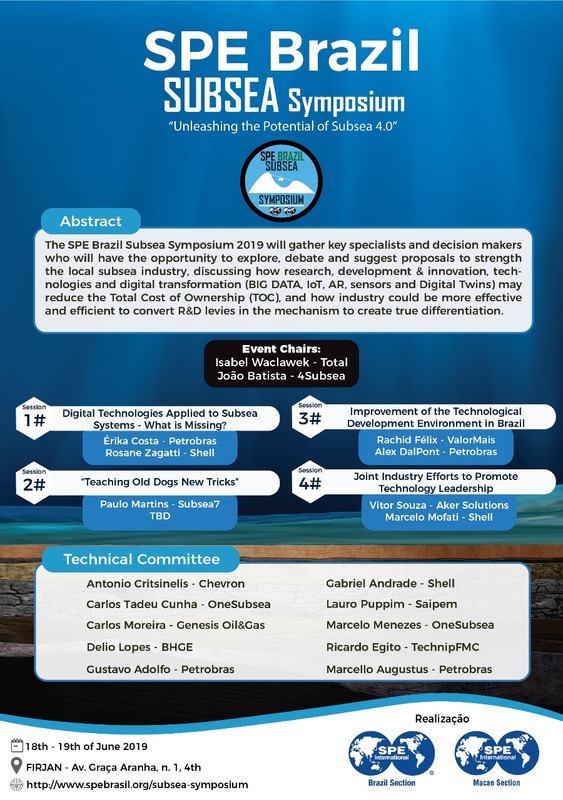 SPE Brazil and Macae sections are pleased to invite the subsea community to the first edition of SPE Brazil Subsea Symposium, taking place on 18th & 19th of June 2019 in Rio de Janeiro, Brazil. The SPE Rio Subsea Workshop is a derived event of the biennial Subsea Rio Forum in workshop format aiming to stimulate interaction among participants, revise critical topics and propose solutions to the subsea community matters. Brazil has been showing its leadership in subsea development through its unique combination of factors such as track record of successful deep-water fields, high interest on recent oil rounds, giant oil fields, R&D levy, already-established research centers, presence of major oil companies and key suppliers. The adoption of “Subsea 4.0” - a new business & technical mindset based in the introduction of digitalization, artificial intelligence, augmented reality and collaboration in the subsea industry - has potential to make Brazil a reference in technical and manufacturing aspects of the subsea industry in the world. Joint industry initiatives (operators, partners, regulators and suppliers) are key to address the issues and coordinate actions to increase competitiveness and sustainability of the subsea sector. In this workshop key specialists and decision makers will have the opportunity to explore, debate and suggest proposals to strength the local subsea industry, discussing how research, development & innovation, technologies and digital transformation (BIG DATA, IoT, AR, sensors and Digital Twins) may reduce the Total Cost of Ownership (TOC), and how industry could be more effective and efficient to convert R&D levies in the mechanism to create true differentiation. "Unleashing the potential of Subsea 4.0"
Digital technologies applied to subsea systems - What is missing? Abstract: It is well known that the industry has high expectations for digital technologies. However, it is necessary to fill a couple gaps in order to unleash it's full capacity. In this session we invite you to join operators to analyze real cases of digital technologies implementation, looking for the missing elements that could represent the game changer for local digital scenario and unlock real benefits from big data. Abstract: The society overall is going through breakthrough transformational processes that is changing the ways we work and live vary fast. This wave has reached already the O&G industry and the subsea sector. Changes in the ways we work had gained momentum with early engagement between operators and TIER-1 suppliers and the inception of integrated supplier led solutions throughout the life-cycle of offshore field developments, allowing prospects to get through FID that wouldn’t fly otherwise under traditional models. These new paradigms are unlocking much greater value to the industry and widening the options for new ways of doing business and build partnerships. Co-creation of solutions among a large eco-system is one of the key value streams that came to fruition. The new challenge to our industry is how to be creative on working together to capitalize at the most from the opportunities out there. Abstract: Considering the new O&G development scenario, after a long deep crisis a clear recover based on ultra-deepwater projects is ongoing. New energy sources are now consolidated. Subsea Industry is exposed to new challenges. Factors as Green Projects, Competitiveness, Shorter Schedules and digitalization must be addressed. Technology is a strong path to solve these issues. Technology development must be done through a collaborative ambient. How to improve it is a discussion we want to promote in this section.